It is another religious holiday in Singapore. No idea which one. I can’t keep track. It could be Malay or Indian or Muslim or even Christian (although you would think I would remember those ones). Whatever, it's a chance to grab another long weekend to travel the region. 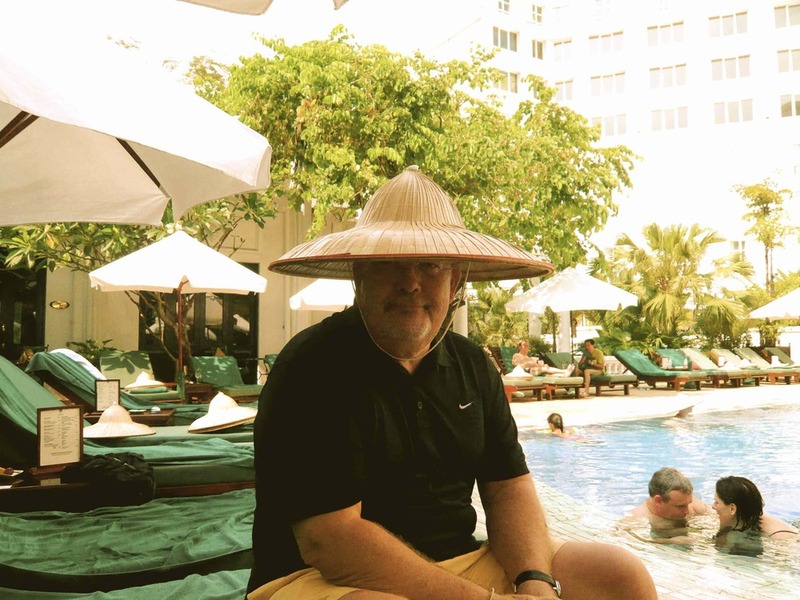 Since arriving in Asia we’ve heard about Hanoi. It certainly seemed like one of the most interesting places to see in Asia, right up there with Angkor Wat. We slipped away to Hanoi on Thursday afternoon knowing very little except for a few articles we found on Google. Only a three hour flight from slick Singapore, it is still old French colonial Asia and yet something very exciting and new is happening too. If you follow the business press, Vietnam is a country of 88 million people that has had steady growth of 7-8% a year for the last number of years. Their poverty rate has dropped from the high 70’s to less than 19% in just 5 years. Under a government mandated policy of “Do Moi” adopted in the late 80’s, investment and free enterprise is encouraged and Communism is of the rather ‘Lite’ variety. The staggering number of giant billboards on the way in from the airport testifies to Nokia, Samsung, Kia, Sony etc. having lots of opportunity for traction here. Of course, underneath the billboards thereare still mile upon mile of rice paddies with barefoot peasants and water buffalo doing the heavy work and not a Honda in sight. It is booming though. Testament to that is the Saudi Prince I have been working for, Prince Alwaleed bin Talal, was there buying hotels and cozying up to the government while we were there. However, there is no Fairmont or Four Seasons there yet, although I don’t think it will take too long given his keen interest and deep pockets. We stayed at the Metropole Hotel, a classic French colonial hostellerie built in 1901. It is, without doubt, one of the nicest places we’ve ever stayed. The restaurants and grounds are amazing, the rooms are perfect, the staff is great and its location on the outside of the Old Quarter is ideal. 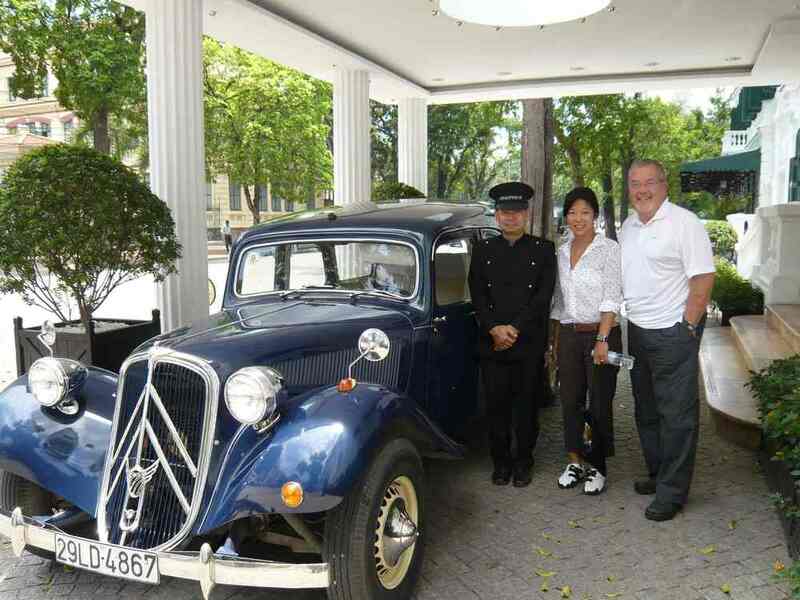 Built by Andre Duchamp, who became its first GM, it was owned by ‘Companie Francaise Immobilliere’ who, aside from other European hotels, ran dining rail cars on French excursions to Hue and DaNang. The hotel catered to a literary/artistic crowd including Noel Coward, Charlie Chaplin, Somerset Maugham and Graham Greene. Greene wrote “The Quiet American” there and decades later, in an odd coincidence, Micheal Caine stayed at the same hotel while filming the movie of the book. Catherine Deneuve stayed at the Metropole while filming “Indochine” and“HanoiJane“ Fonda spent two months being un-American there during the war. Apparently, Joan Baez sang protest songs in the bomb shelter; now conveniently located under the swimming pool. Before and after the French were shown the door in 1954, the hotel has had four different names. The Japanese added one moreand made it their headquarters during their occupation. Most recently, it served as a guest house for local diplomats called the Thong Nhat (Reunification Hotel) and it was under that banner it became a rat infested flea bag only to be saved by Sofitel in the early 90’s who, bless them, restored it to all of it’s colonial grandeur. We took a tour in one of their two 1953 Citroen Traction Avants. A gorgeous French classic that they have completely refurbished including a new engine, transmission and air conditioning. Our liveried driver took us to Ho Chi Minh’s mauseoleum (he wanted to be cremated but they put him on display anyway) and to the Hoa Lo Prison (the infamous ‘Hanoi Hilton‘ where the American POW’s were kept). This is a fascinating experience, and while the Americans were unquestionably treated horribly, the way the Vietnamese were treated by the French for decades before, is truly disgusting. The Guillotines and torture devices on display attest to that. The Americans who were imprisoned get only one small room of memorabilia and photos; including Senator John McCain’s flying suit and helmet. Decades later he too stayed at the Metropole. That must have been weird. We were then driven to a small pond in the middle of the city between apartment blocks where a crashed B-52 bomber has been kept sitting as a memorial. It is sinking a few inches every year buta large part of the wing and the massive undercarriage landing gear still sticks out rather defiantly. Lest you think this town is all about communism and war we then went to the ‘36 Streets’. These are in the Old Quarter and for centuries, have been the streets of all the tradespeople. There is Tin Street, Bamboo Street, Toy Street, Lacquer Street, Cotton Street, Silk Street etc, etc. Every block or so is a Bun Ca stand where 'fresh' beer is served. When the days supply runs out, they close. No place in the world have I found more interesting to walk and shop and just look. The people are lovely and they are getting quite used to foreigners being around. The place is clean, orderly and there is no crime. The city is full of parks and lakes and the street food is fantastic. One thing to keep in mind, there are no traffic lights. To cross the street it is best to have lit a candle, turned a prayer wheel or fired up some incense. One way street, at least six lanes or maybe it was twelve, dark, hundreds of scooters all bearing down on you. All you can do is follow the instructions. Just go. Boldly, no hesitation. They swerve all around you and you make it to the other side realizing you held your breath the whole way. We had dinner at Bobby Chins, a well known guy in Singapore with his own cooking show. Very funky place with great Asian fusion dishes and a spectacular wine list. The restaurant is hung with red gauze panels and it so dark you are given a magnifying glass with a flashlight built in. It’s all in fun and Bobby dropped by for a chat. Uber cool guy that he is, his food was fabulous; fresh and innovative. Remember, this is Hanoi were talking about. Asian art and, in particular, Vietnamese art is very hot. We have bought some nice original oils in Bali and we found tons of galleries in Hanoi. In one of the best, The Apricot Gallery, we found a big oil on canvas by a well known Vietnamese artist. Well enough known that his stuff hangs in the lobby of the Metropole. It was shipped to us in a giant wooden crate and practically made it home before we did. And then it was our last night in Hanoi. It went so quickly and there was so much to see. Most moving I think was the Hoa Lo Prison. Built by the French in the 1800’s and called ‘Maison Centrale’ it was the largest prison in French colonial Asia. Mostly torn down it is just a museum now and while the American War (that’s what they call it there) and the U.S. pilot prisoners are made to look all too well fed and well cared for in the pictures, the horrible treatment of the Vietnamese over nearly a century by the French is more shocking. Sure, the Vietnamese treated their American prisoners badly but they learned how to do that from the French. You certainly get a sense from the prison, the reverence for Ho Chi Minh and from the determination of the people that this country has seen the worst that invading Chinese, French and Americans could throw at them over centuries and they would never, ever give up to any of them. Yet, they welcome French and Americans now and simply say ‘that is the past’ when you ask them about it. Forgiveness is a recurring theme in Asia. Our last night was dinner in the old quarter and back to the lovely Metropole Terrace Bar where you sit under a ceiling fan and a misting wand of cool spray and watch the world go by. Scooters. Hanoi has 3.5 million people and just under 2.0 million scooters. They are imitation Hondas from China that can be bought for just $500. Cruising is the thing to do here and the more you can fit on your Honda (or bootleg Honde) the better. We counted five people on one little bike. In December of this year the government enacted the first helmet law. At midnight, all scooter riders had to wear a helmet. Problem is, in Hanoi cruising is dating. How can the boys see your gorgeous hair if you have a helmet on? Despite protests it is now law and would have been a pretty good business to be in for a few weeks. On Sunday morning we were up early to catch the plane. I went for a walk about 6:00am to take some pictures of the quiet, tree lined streets. Quiet? I counted 20 badminton games going on the sidewalks around the hotel and in the park. There were two Tai Chi groups back to back and the streets were full of those damn scooters. Four days. We have not even scratched the surface of Vietnam. Like their laquerware, it is deep and rich and worth the trip. Vietnam. See it before it gets ‘ Gucci-ed ‘. Update 2013: OK, it got 'Gucci-ed '. We have been back twice and from having no Louis Vuitton, Gucci, Chanel, etc; they are now everywhere. The Metropole is still stunning, Bobby Chins is still open but they've moved and scooters are starting to give way to cars. Now you see Bentley's and Mercedes 500's all over the place. Still charming, still wonderful food, Old Town still great. Just moved into the global orbit a bit.